The Año Nuevo Coast Preserve: California Wildlife at its Best! The Año Nuevo Coast Natural Preserve is designated at Año Nuevo Point to provide wildlife viewing opportunities and minimize disturbance to the animals in their natural habitat. Visitor entry into the this area of the park is restricted year-round. Acces is by park issued permit or guided walk. During the “Molting Season,” the Wildlife Viewing Area within the Natural Preserve is open for self-guided hiking by Visitor Permit only. Obtain your free Visitor Permit daily from the entrance station, between 8:30 am and 3:30 p.m. No reservations are required and no Guided Walks are offered. Visitors must exit the Natural Preserve by 5 p.m., which is earlier than the general parks closing hour of sunset. Please plan to arrive early enough to obtain a permit and make the three to four mile hike before 5 p.m. Most groups require about two and a half to three hours to make the round-trip hike. By summer’s end, most elephant seals have returned to sea to feed. Small numbers of one to three year old juveniles haul out on remote beaches as part of their early development. During the “Fall Haul Out” the Wildlilfe Viewing Area of the Natural Preserve is open for self-guided hiking by Visitor Permit only. Obtain your free permit daily from the entrance station, between 8:30 am and 3:30 p.m. only. No reservations are required and no Guided Walks are offered. Visitors must exit the Natural Preserve by 5 p.m., which is earlier than the general parks closing hour of sunset. Please plan to arrive early enough to obtain a permit and make the four to five mile hike before 5 p.m. Most groups require about three hours to make the round-trip hike. Pregnant females and adult males begin to arrive on the beaches and form harems. Visitor access is closed during this period. Northern elephant seals come ashore to give birth and mate from early December through March. Bull seals engage in battles for breeding access to the females from early December through January. Pregnant females come ashore to pup from late December to early February, and mothers nurse their pups for about a month before mating and returning to the sea. By early March, most of the adults have returned to the sea. Pups remain behind through March basking in the sun and learning to swim in the intertidal zones. 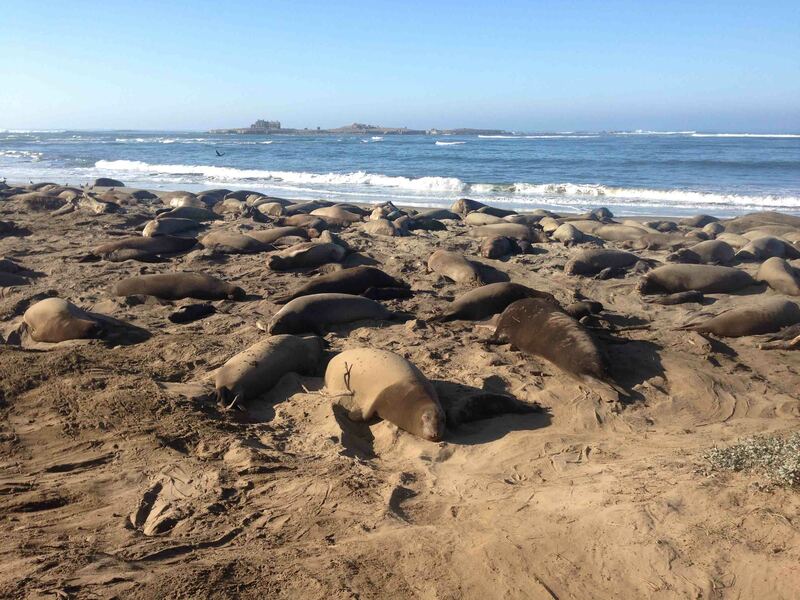 Año Nuevo State Park offers docent-guided walks between December 15 and March 31, which feature the elephant seals in their natural habitat. 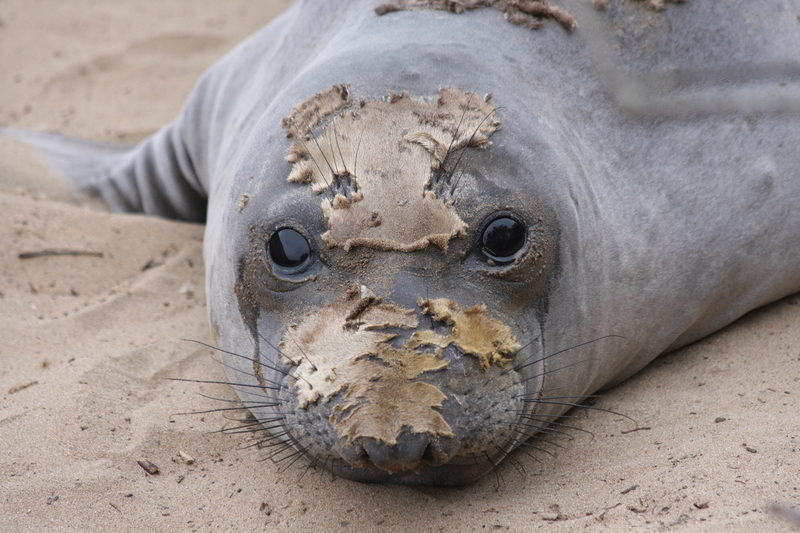 To view the elephant seals during this season, you must be on a guided walk. 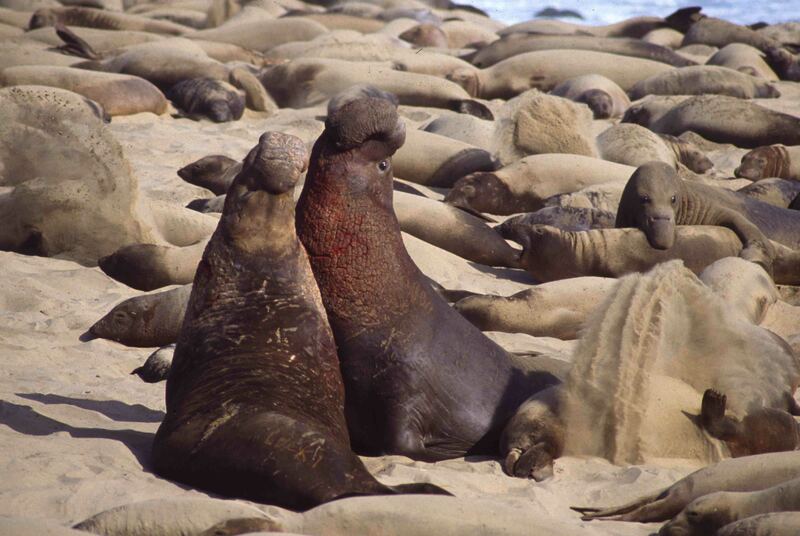 Elephant seal viewing requires a 3-4 mile moderate hike over varied terrain, including sand dunes. The walks last about two and a half hours. They operate daily from early morning to mid afternoon.